This tender was awarded to Prefab Building Systems Australia at the October, 2013, Ordinary Council Meeting. Design development was completed to incorporate a number of changes requested by the Client and local SES and DFES branches. 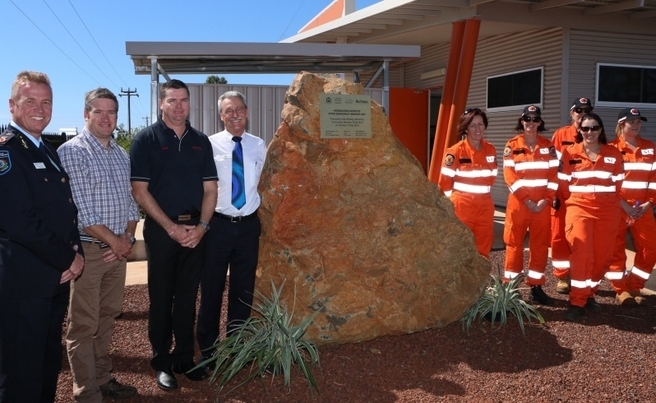 Roebourne Districts SES Unit was officially opened on May 10, 2015 by Hon. Brendon Grylls along with City of Karratha Mayor Peter Long, Fire and Emergency Services Commissioner Wayne Gregson and Rio Tinto General Manager Ports Cape Lambert Jamie Robinson. Notification was received in July, 2013, that the DFES Capital Building and Equipment Grant application was successful for the amount of $1,207,700 for capital works. A copy of the building design was approved for construction by DFES as per the terms of this agreement. Rio Tinto has also contributed to this project with funding to the value of $400k.